Veggies Rule: Free Range Pigs in N.Z.? 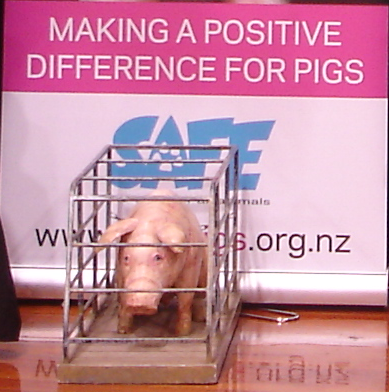 A few weeks ago I was on a SAFE stall which had on display a pig in a sow crate. This, as you can imagine, stimulated a lot of discussion and helped to raise awareness of how we are still factory farming in this country. However, one man in particular was on the side of the pig farmer saying that the crates and small stalls were necessary as N.Z. pig farmers must farm intensely in order to make a living. His argument was that the price of imported pork made it impossible to compete in the local market if the farmer wasn't able to use these (barbaric) practices. He maintained that the pig farmer would like nothing more than to have his pigs living in better conditions, but he is unable to do this if he wishes to keep the price of pork at a low level. And should we deny low income families from having N.Z. pork on their table? Note: I've heard this argument before not only with meat but with eggs as well. Let's be straight here before I continue. I am vegan and wish that the world was also. I do not support any farming methods as I do not support the slaughter or exploitation of animals. However, I'm also very much a realist and understand that people will continue to want meat on their menu for some time to come. What I do contend is that we have been pushed into eating more meat and poultry by the food industry and the argument that the meat, dairy and poultry industries are only meeting consumer demand is total garbage. It was these industries that started the "need". Why can't we go back to making pork a luxury item as it was when I was a kid? Stop importing the pork from overseas especially as we have no idea how it has been farmed and I'm guessing it will be just as bad if not worse that we have here in N.Z. Let the pig farmer get top dollar for his meat and allow him a decent profit to put back into his farm. Less demand would take the pressure off the farmer to intensify his numbers but rather to go for the free range style of farming. At least the pig will have some sort of decent life before the horrendous end comes. This is taken from the site Pig Farming in N.Z. talking about free range: Pigs require special conditions, such as firm soil and a mild climate if they are to be raised in this style. Farming this way requires a greater number of staff, as pigs are exposed to all the elements and need constant care and attention. This is why most farmers using this style are smaller farms, with a small number of pigs. 1% of pigs farmed in NZ are farmed like this. So I doubt if I'll see any change in the near future. We are a primary producing country. I am hoping that in my lifetime I will see the intensity of farming diminish, an intense program of vegan education and making meat the luxury item rather than the "norm". If we can get to that stage before I shuffle off this earth, I'll be happier than if the reverse happens.